Mast Mango Kulfi…..Yes just the way it sounds. This mango kulfi is made out of Fresh Alphonso Mango, Cream, Milk, Condense Milk, lots of Dry Fruits and freshly hand grinded Cardamom seeds and Saffron. 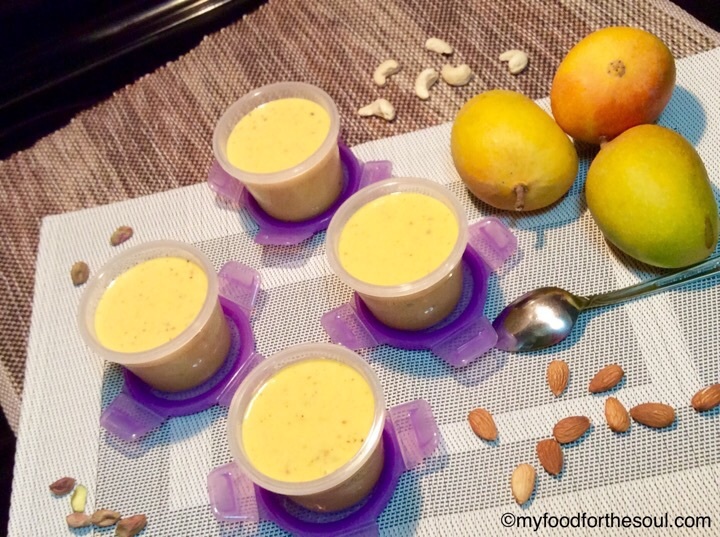 I’ve used my all time favorite “Alphonso Mangoes” in these kulfis. 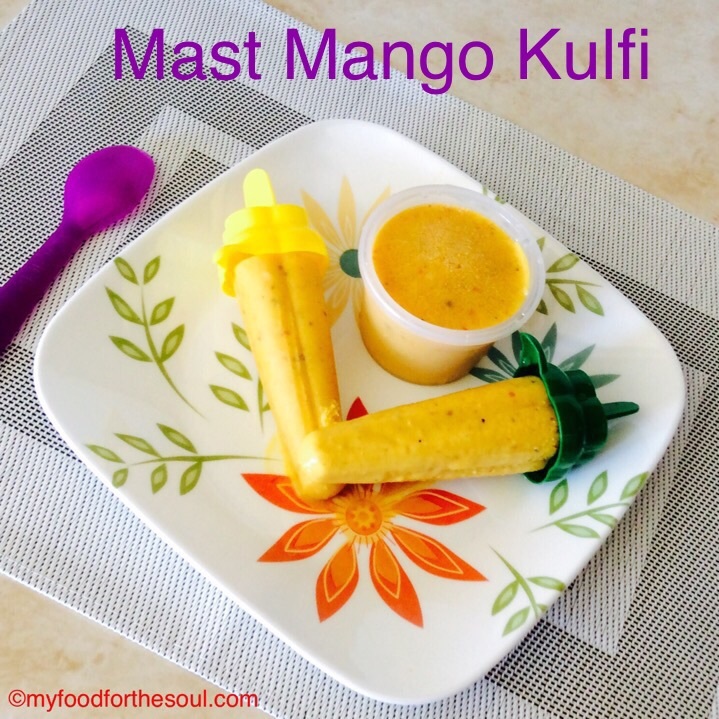 My Mango Marathon continues and here I’m bring to you another absolute must try delicious dessert “Mast Mango Kulfi”. Actually, this isn’t just a dessert it’s an all time summer favorite of many. This Mango Kulfi can be eaten as is or made into a “Mango Falooda”. The best part of this kulfi is that it requires no cooking or slaving over the stove …for long periods of time. All of ingredients just need to be put into a blender and blended to a smooth consistency and poured into your desired kulfi tray, Popsicle tray, single server cups with lids any container of your choice and freeze. “Four easy steps “blend it” “pour it” “freeze it” and “serve it” to make sweet, delicious, mouth-watering “Mast Mango Kulfi “. I’ve used finely crush dry fruits – Almond, Cashew Nuts (Kaju), Green Pista (Pistachio) which I always keep available in my pantry for immediate use. I make the finely crushed dry fruit mixture in my coffee grinder. 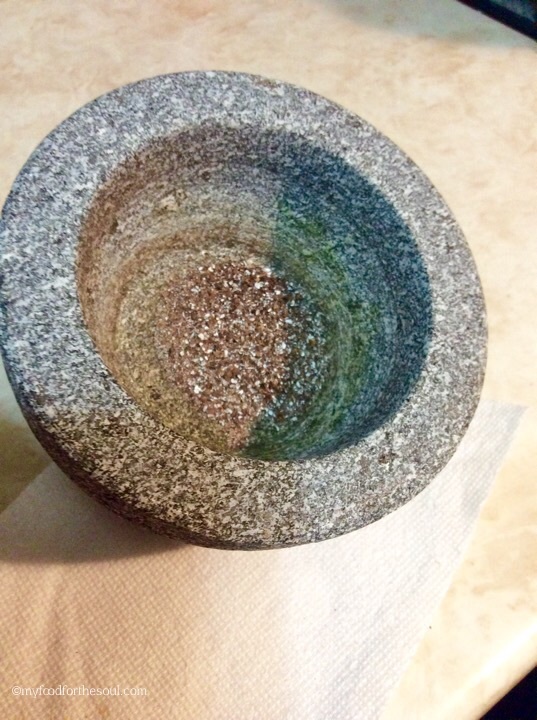 For this recipe I’ve actually used a “Mortar and Pestle” to grind the cardamom and saffron into a fine powder. This help to enhance the flavor and color of the kulfi. Into a blender add in all of the ingredients except the cardamom powder and saffron and blend everything till smooth consistency. Add in the cardamom powder and saffron and blend till the everything is mixed and incorporated well in the mixture. 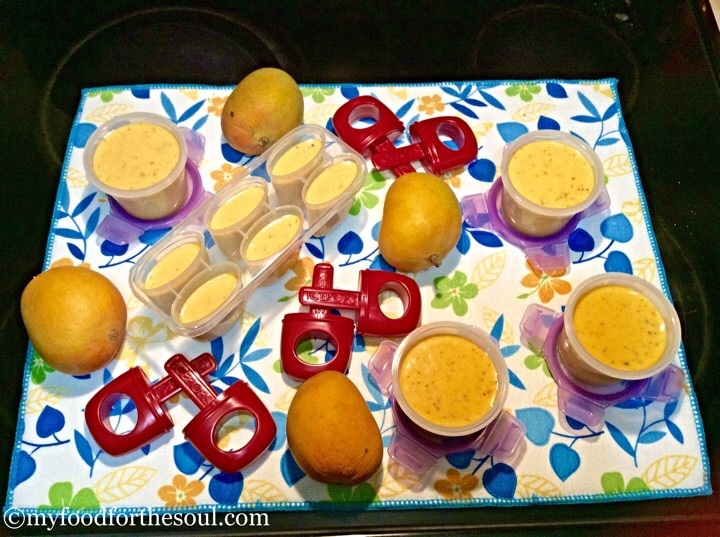 Pour the mango kulfi mixture in kulfi tray, popsicle tray or small container. (your choice). Make sure small containers are covered with a lid or aluminum foil and keep in the freezer for the kulfi to set. Let it set for 5-6 hours. To remove the kulfi, place the kulfi tray under running water for some seconds or rub them between your palms. With a butter knife, gently remove the kulfi. Let it freeze for 5-6 hours. You may fine little ice crystals in the kulfi, but because this is the quick and easy version of the recipe.